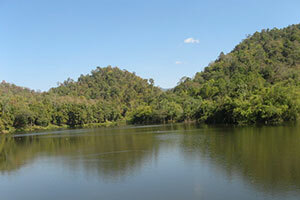 Mae Ta Krai Reservoir The site of the National Park office. It is surrounded by mixed deciduous forest and bamboo forest. There are nature trails around the reservoir. The distance is about 3 kilometers. Travel From Chiang Mai, take Highway No. 1006 to Mae On District. At the crossroads of Wat Pao Samka School Turn right in to Highway No. 1229 for another 4 kilometers until checkpoint 1, continue for another 10 kilometers and turn left to Ban Huay Kaew about 800 meters.